AMSA Executive Board 2018-2019: We’re Here To Help! 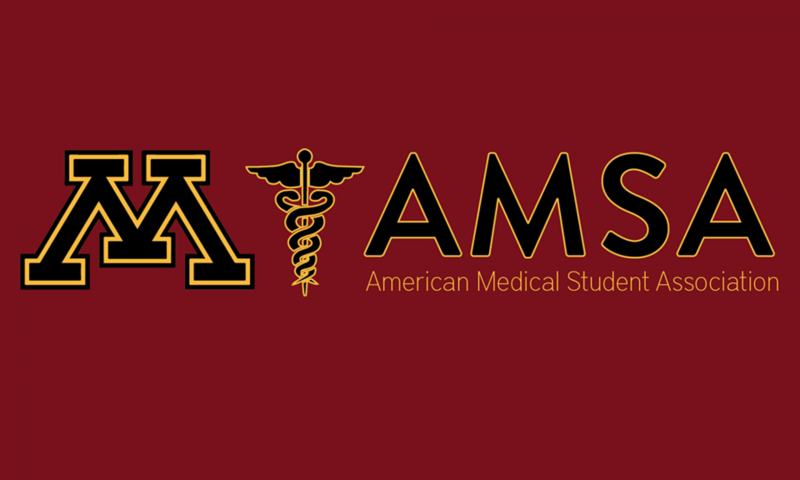 2018 – 2019 AMSA Executive Board! Campus involvement: On campus, I am on the girl’s basketball scout team, a part of the ALS Association, and am a scribe and nutrition services aid at HealthEast locations! I have studied tropical wildlife conservation in Malaysia, and have also done a medical trip to Uganda/Rwanda, plastic surgery rotation in Spain/Portugal, and ocean acidification in the islands of Belize. I plan to take a gap year to hopefully head back to my friends and doctors in Uganda for a few months after graduation and do other various travels. I recently spent 3 weeks in Cuba for this past 2018-2019 winter break! Hobbies: In the summer, I umpire little kids and stay busy with working at HealthEast. This summer will be consumed by the application process for MD/DO programs! Specialty of interest: Family medicine in a suburban/ rural area. Most treasured AMSA memory: Going to Nationals last year in D.C. with the board and general members! Learned some great information and had time to have some fun/ sight see. Campus involvement: This year I am working as a Junior Guild Leader for the College of Biological Sciences, and I am an active member of the academic sorority, Lambda Delta Phi. I love volunteering at the St. Paul Children’s Hospital and serving as a Health Advocate on campus. This May I studied abroad in the Galapagos Islands and have developed a passion for teaching and communicating evolution. Hobbies: I love crocheting, cats, mentoring my robotics team, and running! I also love singing and am a member of the UMN Gospel Choir. Specialty of interest: My dream is to become an osteopathic physician and specialize in pediatrics or family medicine. I really hope to work in primary care and develop relationships with patients that extend both in and outside of medicine. Most treasured AMSA memory: My favorite AMSA members go back to my first year when I participated in the ELE program. I have a passion for teaching and every week the curiosity and engagement of the students inspired and challenged me! I loved passing on my love for science and growing roots in my new Minneapolis community. Campus involvement: I work as an Emergency Department medical scribe at St. Francis Medical Center, which I have done for the past three years! I am currently studying for a spring MCAT so this is my only other EC outside of AMSA at the moment, however, I have also spent time working as a lab assistant on campus, volunteering at Abbott-Northwestern Hospital, participating in intramural volleyball and being a Welcome Week Leader! Hobbies: Outside of classwork and my job, I enjoy watching Netflix/ Hulu, hanging out with my friends, discovering new music, and lifting! Specialty of interest: II hope to practice Emergency or Internal Medicine in a major metro area and also work to promote health education in inner city environments, particularly with emphasis on preventative medicine. Most treasured AMSA memories: My favorite AMSA memories have been attending conferences, including fall conference last year and pre-med fest this year, as they provide a chance to get to know members outside of your friends and continue to learn about the field we will be going into. I am looking forward to (hopefully) going to Nationals for the first time this March! Campus involvement: When I’m not working, volunteering, or studying I like to spend my free time playing a board game known as Go! Fun Fact: After high school, I took a gap year to travel the lower 48! Specialty of interest: I’ve always been fascinated with the brain and how/why it works the way it does. I’m planning on going to medical school and choosing a specialty that deals with the CNS. Most treasured AMSA memory: Going to National Conference these past few years and getting to talk and interact with other pre-med and med students throughout the convention. Also, many of the talks were highly informative and interesting. Campus involvement: I am a researcher in the Laboratory of Medicine and Pathology on campus working with a category of melanocytic lesions. In addition, I am a Sophomore Guild Leader for the College of Biological Sciences. A large portion of my time is also spent dancing with the UMN Dance Collective! Hobbies: Aside from classes and research, I enjoy dancing, hanging out with friends and family, eating lots of ice cream, watching movies, shopping, and traveling! Specialty of interest: In the future, I would like to pursue a specialty in either Family Medicine, Pediatrics, or Hematology, Oncology, and Transplantation. Most treasured AMSA memories: Getting the opportunity to travel to AMSA Nationals last year in Washington D.C. with the board and general members! I also am a big fan of the suture clinics and physician dinners! Campus involvement: AMSA, VP of USIG, Anatomy TA, and a cycling instructor at the RecWell. Hobbies: Hiking and walking my dogs as well as cooking (at least attempting). Specialty of interest: I hope to become a surgeon or work in critical care/ trauma, maybe combine them both and be a trauma surgeon either in civilian or military life. Of course, I still find almost everything fascinating so it will be interesting to see where I end up. Most treasured AMSA memories: Sitting in my first ever AMSA meeting realizing there are so many people like me who are as passionate about medicine and a life of serving others. Campus involvement: I am a researcher in the Gralnick lab of molecular biology and biophysics! I’m also in a sorority, Alpha Gamma Delta, and I’ve served on the academic committee. I also work as a medical scribe at United Hospital in St. Paul! Specialty of interest: I am hoping to be either a plastic surgeon or an OB/GYN! Most treasured AMSA memories: Going to nationals in Washington in D.C., it was so fun to spend time with other pre-meds. I learned so much! Campus involvement: I am involved with the Society of Women Engineers ( a great group btw!!) and I also work as a campus tour guide at the Admissions office! Hobbies: I really like to play my violin, dance, bake, and do pilates! Specialty of interest: I would really like to work in Pediatric Oncology, and I know, I know that that line of work is super tough, but I think it would be really rewarding. I also have personal experience with someone battling cancer at a young age. Most treasured AMSA memories: One of my favorite memories from AMSA was attending the first pre-med dinner of my first year in AMSA, it was really rewarding. I spoke with a lot of physicians and got their advice, plus I made some new friends! Most treasured AMSA memories: Attending “Living with Tigers” which was a talk about childhood trauma at the AMSA National Convention.